IDIOT SIGHTING: Hubby and I had to have the garage door repaired. The Sears repairman told us that one of our problems was that we did not have a "large" enough motor on the opener. I thought for a minute and said that we had the largest one Sears made at that time, a ½ horsepower. He shook his head and said, "Lady, you need a 1/4 horsepower." I responded that 1/2 was larger than 1/4. He said, "NO, it's not. Four is larger than two." We haven't used Sears repair since. IDIOTS IN FOOD SERVICE: My daughter went to a local Taco Bell and ordered a taco. She asked the person behind the counter for "minimal lettuce." He said he was sorry, but they only had iceberg. He was a Chef? Yep...From Kansas City! IDIOT SIGHTING: I work with an individual, who plugged her power strip back into itself, and for the sake of her own life, couldn't understand why her system would not turn on. A deputy with the Dallas County Sheriffs office no less. IDIOT SIGHTING: When my husband and I arrived at an automobile dealership to pick up our car, we were told the keys had been locked in it. We went to the service department and found a mechanic working feverishly to unlock the driver's side door. As I watched from the passenger side, I instinctively tried the door handle and discovered that it was unlocked "Hey," I announced to the technician, "Its open!" His reply, "I know - I already got that side." This was at the Ford dealership in Canton, Mississippi! A Catholic Mom in Hawaii links to an excellent video from the Hawaii Catholic Herald about the “Damien Day” celebrations that we both attended this past May. That video brings back many, many happy memories of that blessed day. It doesn’t help my desire to leave for Hawaii at the drop of a hat! I’m captured on the video at one point with my friend, Ian. Does anybody know if there is a way to save the video? I should like to keep that one. The Herald also has a video of the song “Damien the Blessed” that is rather catchy, if I do say so. It's 7:46 a.m. The clouds are gone. The telephone has yet to ring. The sun continues to rise. And it's 30.2 degrees outside. But it isn't working. I'm not ready for this. Is there a patron saint for unseasonably warm temperatures for a good length of time? On a happier note, later this morning I'll bless my first R.V. before some parishioners head off tomorrow to warmer weather for a time. To be a priest of Jesus Christ is to be one whom he has called and has configured to himself to be his own instrument. The priest is the one who makes Christ present in the world through the sacraments he celebrates and the life he lives. See, daily He humbles Himself (cf. Philippians 2:8) as when He came from “the royal throne” (Wisdom 18:15) into the womb of the Virgin; daily He comes to us in a humble form; daily He comes down from the bosom of the Father (cf. John 1:18) upon the altar in the hands of the priest. The Lord Jesus takes the hands of the priest and makes them his own to extend his healing touch and loving presence in the world. In light of how Jesus uses his priests, what other response can one have but awe, love and humility? My God, what a life! This sounds a high and lofty ideal, yes, but it is true. This is what every priest is called to be and to do, though not all, we know, attain it. Priests, like all people, are at times the Pharisee in the Gospel and at others the tax collector (cf. Luke 18:9-14). We know that priests can be proud, arrogant and haughty. They can also be humble, compassionate and sincere. They can be sinful and they can be holy. They can have bad days and they can have good days. Each priest, like every member of the faithful, is a redeemed sinner; even so, Christ chooses to use his priests, sinful men as they are, to sacramentalize his presence in the midst of the world. Who of us would ever choose to do such a thing, to do something so dangerous as to entrust that which is supremely holy to sinners? Yet it is precisely this that the Lord does. The strange thing is … that God entrusts himself to such fragile vessels. That he has taken such a horrible risk with the Church. He has put himself into hands that betray him time and again. And he has left us the opportunity of falling and of being corrupted, so that he still has to support the Church himself again and again through these very tools that have proved unsuitable. It is a consolation, on the one hand, that the Lord is stronger than the sins of men, but, on the other hand, a great challenge for all those who have turned toward this calling and who believe they have received it to let it truly mature in fellowship with Christ. Every priest, then, needs our prayers each day that he might more fully imitate the Lord Jesus each day of his life, to be his docile instrument so that his life may give greater witness to God who is love. It very often happens that when a young man first hears the Lord calling him to the priesthood he is reluctant to respond. When Christ says to him in the silence of his heart, “Come, follow me” (Matthew 4:19), the young man responds, “Depart from me, Lord, for I am a sinful man” (Luke 5:8). This was my own response when I first began to recognize the call of the Lord. I was all of fifteen years old. To the one who beckoned, I said, “Surely there are others, Lord, others better than I, more gifted, more talented, more popular, more holy.” Yet the Lord did not relent; he simply said, “Follow me,” repeatedly and incessantly. It often happens that we do not understand the ways of the Lord, yet we must trust that he does, in fact, know what he is doing. He knows whom he calls and why he calls them. If they are not already equipped for the mission when he calls them, he will see to it that they will be when the time comes. The Lord is skilled at using insufficient instruments for his purposes. I knew I was – and am – unworthy of the call of the Lord, of sharing in his own priesthood. I knew I had failed time and time again to love as he loves, yet he still called me to his service. I said, “Why me, Lord?” His answer was simple: “Why not, you?” I had no response and I knew I was his and that I was to be his priest. Conscious of this to this day, I encourage all young men who hear the Lord Jesus calling them to his service: Do not be afraid! If the Lord wants you, give yourself to him. He knows what he is doing. He will not abandon you. He will not disappoint you. He will fulfill your deepest longings, all through your devoted and faithful ministry in his name. On behalf of my brother priests, I thank all of you for your prayers and encouragement; your cards and notes of gratitude are very uplifting. There is, though, one way that you can thank us above all others. First, continue your prayers for us, each day if at all possible. Second, encourage those young men you know the Lord to be calling to heed his voice. Through your encouragement they may begin to see something in themselves that would lead them to trust more fully in the Lord and follow where he leads. In this way the “prayers of the lowly [will pierce] the clouds,” the Lord will hear us and rescue us in our distress (cf. Psalm 34:18) through the ministry of his priests. Amen. Saint Francis of Assisi, Adominition I.14. Joseph Ratzinger, God and the World: Believing and Living in Our Time: A Conversation with Peter Seewald (San Francisco, California: Ignatius Press, 2002), 430. Catechism of the Catholic Church, 1578. The web site of the Congregation of the Sacred Hearts offers this short bit. They also have a short biography of Blessed Damien de Vuester. Please pray for the swift canonization of the "leper priest". This evening I traveled with Carolus (not his real name) to Casey, Illinois to watch our girl's volleyball team compete in the regional matches. After the girls won their first game we decided to go out for a quick bite to eat while two other teams played. We went to the McDonald's in Casey and found one of the most freakish and frightening things I've ever encountered: karaoke night. That's right. Karaoke night in McDonald's and no alcohol of any kind. I don't drink alcohol, but had there been some I might well have just to deaden my senses. I've never been to a karaoke event before. I've also considered the very notion of it scary and tonight my thoughts were confirmed. Why would anyone want to listen to people sing songs badly? Why do people applaud obviously horrible singers? It only encourages them. Carolus and I finished our meal more hurriedly than we might have otherwise. Returning to the gym some of our high school students began to arrive for our girls' second game. I related to the incident to them and the Great Gobbler - one of our high school who can gooble very much like a turkey - exclaimed, "Well, what are we doing here?! I'll go if Father goes!" "I think I'll stay here," I answered, to which she responded, gratefully, "Thanks, Father!" She very nearly got the both of us in trouble. The kids later assured us if we did go back we'd get an entire yearbook to ourselves. At any rate, the girls won both of their matches, thereby winning the Regional. Congratulations, girls! Amy has a good post about Willow Creek, the "mega church" in Chicago Land. As per her usual, it's well worth a read. The Crescat offers her thoughts and rules on "anonymous" posting. I rather agree with her. The Lion and the Cardinal has some great photos today, one of a monstrance that I would not want to have to lift and of a thurible that I would love to use. My little Hawaiian getaway this past May seems to have changed me in ways that I am only continually realizing. These past several days the autumn season has fallen upon us (tacky and expected pun intended), much to my dissatisfaction. The sun is obscured mostly - if not completely - by clouds. The winds come from the North. And the temperature doesn't even breach fifty degrees. In short: it isn't at all pleasant and I don't like it one bit. I am not ready for Fall, and I'm certainly not ready for winter. I've never really liked winter. The autumn I have in the past enjoyed because of the beauty of the changing colors, yet even this beauty never quite made up for the impending doom. This year I seem to have not just a dislike of winter, but a loathing of the cold season of death. My gloves have been out and in use for some weeks now. A hat of some kind is most always with me now. I took out my scarf this morning. My wool overcoat - which the high school kids seem to like as much as the cape - is also in use (you can't wear the cape everywhere). Winter is, I think, a direct result of the first Fall, that of Adam and Eve, and a season that I would not miss if it were never to occur again (theological discussions may follow in the com box). Some say the change of seasons is a good thing; I respectfully disagree. I had one thought: Why am I here and when can I leave? Now, with these thoughts in my head and the grey bleakness of the autumn clouds overhead, I am to a volleyball match in Casey, Illinois. Our girls have been playing well and I'm off to cheer them on. The Crescat offers us the quote of the week - or maybe even the month - in her take on J. K. Rowling's recent announcement that Professor Albus Dumbledore of Hogwart's fame is homosexual: "Nothing pisses off skipping fairies more then members of their own camp living a pure life of self denial not being driven by lust for the flesh." The aptly named Carolina Cannonball suggests turning this bizarre announcement into a teaching moment about the Catholic teaching on human sexuality by focusing on chastity. Do have a read. Thomas Peters, the American Papist is in the running to receive a blogging scholarship. If you have a kind moment free, please vote for him here. You don't even have to register. Capello Romano tip to SFO Mom. A Catholic Mom in Hawaii passes along the happy news that a second miracle for Blessed Damien de Vuestra (a.k.a. Damien of Moloka'i) has been confirmed. If you're looking for a fantastic and easy fund raiser, you need look no further than Ignatius Press' I'm Dreaming of a Catholic Christmas. I've already signed up my World Youth Day 2008 pilgrims. In other WYD news, Pope Benedict XVI will be brought ashore aboard the largest cruiser in Australia. It seems I posted this by mistake at A Beggar for Love on the 20th. Greetings from St. Francis of Assisi Friary in my beloved home of Quincy! The friars are very kind hosts and I might have to see about staying here more often. It’s very peaceful and quiet. Refreshing, really. I have returned to the Gem City for the wedding of a friend from high school. Rose remains of my few high school friends with whom I have managed to stay in contact. At the reception, which begins in just a few minutes, I’m expecting to see another friend from high school, whose name happens to be Darren (notice he has two ‘r’s). I left Effingham yesterday afternoon after concluding parent/teach conferences in a bit of hurry, which is never a good idea. About halfway to Quincy, and already on schedule to arrive late for the rehearsal due to incredibly high traffic on the highways, I realized I had forgotten to bring something that I have never forgotten before: my Roman collar. I really need a personal assistant. Ordinarily this might not have posed much of a problem. However, this time I decided only to bring my cassock and just make travelling simple. That will teach me. The cassock, minus the collar, looks extremely goofy. Not sure what else to do, I called the Cathedral and asked if I might borrow one of Bishop Lucas’ collars as he and I have roughly the same neck size. Naturally, he wasn’t in. About thirty minutes later I received a call back to the affirmative, much to my great relief.I had already resolved to go through the practice and hop back in my car to return to Effingham to fetch my collar. I didn’t really have any other option. It’s the curse of being a smaller priest. As it happened, one of the priests who serves at the Cathedral happened to be coming to Quincy last night for a weekend with our candidates for the permanent diaconate, which was a good thing before I had already passed through Springfield. He very kindly brought the collar with him and gave it to me. Consequently, I ran the rehearsal in jeans and a DrPepper hoodie, a first in itself, (it’s about all I had with me) but afterwards put the cassock on and went to the rehearsal dinner. Bishop Lucas has arrived in Quincy this afternoon for his pastoral visit to St. Francis Solanus parish. I haven’t seen him yet, but I’ve heard he has arrived. I will return his collar with many thanks tomorrow morning before I return to Effingham in time for our end of the year soccer party. Through this little adventure I learned one thing: always keep a spare collar (and cuff links just in case) in the glove box, because this will happen again sometime.More posts about the Quincy visit to come. The land of milk and honey? It might not be the Promised Land, but it isn't too far off! It is, afterall, the land where "life is good." I promised another post on the weekend wedding and here it is. After the rehearsal concluded this past Friday night, the wedding party went to The Patio for the rehearsal dinner. The meal was very good and I was able to sit next the bride, Rose, and continue catching up. The pastor of the parish in which the wedding was held also came to the dinner (he sat next to the groom, Craig). For desert, we had that for which The Patio is famous: peppermint ice cream. It was delicious! Afterwards we retired to the bride's parents' house, where in high school we spent many enjoyable evenings playing Mario Kart with our circle of friends. Rather than playing the excellent game, I engaged in a intellectually enjoyable conversation with one of the bridesmaids, Erin, who happens to be an agnostic (and she even knows the meaning of the word). She was a lot of fun and quite intelligent. She asked very good questions and listened to my responses before replying. It was refreshing! At one point she exclaimed, "You have an answer for everything!" I guess all of those many nights arguing with football players paid off! I'm not sure her boyfriend enjoyed her asking so many questions (I think he was a bit embarassed), but I'm glad she did. The next morning, being hungry for a tasty breakfast, I crossed the street from the church and went to Underbrinks Bakery to pick up a few pastries. I'd forgotten the splendor of a real bakery! I then wandered down to the riverfront before heading out to look for a new pair of cuff links (you'll recall I'll be keeping a pair in the car now). Having found a pair that I liked I returned to the parish to prepare for the wedding. The wedding itself went very well, I'm glad to say. I spent the afternoon reading in the garden of the friary, after having first taken a swing by the Maid Rite for a quick - and extra tasty lunch. It's been a while since I've had the opportunity to read for a good length of time so I welcomed this chance quite happily. At the reception I sat at a table with my good friend from high school, Darren, and his wife, and with Erin and her boyfriend. It was a great evening. After visiting for about two hours inside, Darren and his wife had to head out because they had an early morning ahead of them. I walked them out and ended up talking with the two of them - and Erin and her boyfriend - until midnight! I've always enjoyed spending many hours talking in parking lots as everybody says they have to leave. It's a habit that started in high school and hasn't gone away. Sunday morning I paid a visit to the cemetery to pray at my parents' graves since I won't be able to go on All Souls' Day. Bishop Lucas was at the parish this weekend for his pastoral visit, which afforded me the opportunity to serve as the Master of Ceremonies before leaving Quincy to return in time for the end of the year soccer party. Nicholas at PhatCatholic Apologetics has a link to some very cool t-shirts (I've ordered the one on the right). Eight years ago this morning I awoke earlier than usual to keep a routine appointment with my doctor in St. Louis. I was at the time a senior in college working not very feverishly on one of my two senior seminar papers (the first on King Arthur, the second on Fr. Augustine Tolton). Right about 6:00 a.m. my telephone rang, which was a rather unusual occurrence for that time of day. Being a resident assistant, I presumed one of the football players had locked himself out of his room, which was not an unusual occurrence. Being an RA in a dorm of football players was certainly an experience, and a good one at that. It taught me much, some of which I'm glad I learned and some of which I'd rather not know. As with all things, there were days I dreaded it, but overall I greatly enjoyed it. There's nothing like philosophical and theological debates in the hallway until 3:00 a.m. with half a dozen non or irreligious people all trying to out argue you to keep you going. It really was a lot of fun! Given the opportunity I'd be an RA again in a heartbeat. I digress. After I answered the telephone not very happily, the voice on the other end was Bro. Thom, the Franciscan friar I worked for and with in Campus Ministry (it wasn't unusual for him to call at such hours, since he'd already been up for an hour or two and thought nothing of it). BT (as we called him): You have a new Bishop. BT: You have a new Bishop. Me: Really? How do you know this? BT: A friend from Rome just called; it was just announced. Me: (Honestly thinking he was making a prank call (which he hadn't done before [at least not to me], but would be in keeping for him:) What? You're making this up. BT: No, really. He's the rector of Kenrick-Glennon in St. Louis. Me: (Still a bit skeptical:) Are you sure? BT: Yes. Turn on the television; it should be on the news soon. Sure enough, he was correct. We did indeed have a new Bishop and his name was in fact George Lucas. Eight years ago this morning Pope John Paul II appointed then Monsignor George J. Lucas the eighth Bishop of the Diocese of Springfield in Illinois. 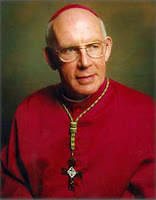 Bishop Lucas' coat of arms, with a description, are now on the Diocese web site. In the com box on my post about the forthcoming consistory, a reader was kind enough to remind me that Archbishop Sean Brady, Primate of All Ireland, recently visited the Diocese of Springfield in Illinois. One of my priest-friends reminded me of the visit last night, though I forgot about it when I awoke this morning. Please remember Fr. 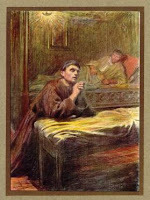 Brady in the charity of your prayers. I do hate grammatical mistakes, my own especially! Hat tip to A Catholic Mom in Hawaii. If your surname happens to be Griffin, an excellent device for architectural ornamentation. When the first Bishop of the Diocese of Springfield in Illinois, James Aloysius Griffin, set about the construction of the Cathedral of the Immaculate Conception he made good use of the mythological creature that bears his name. Personally, I am a great fan of the griffin and have been since I was a young boy. Because the griffin is both a nonexistant creature and a product of pagan mythology some might well wonder why the Bishop chose to incorporate it into his Cathedral. At first glance the griffin doesn't seem to fit, but in the heraldic tradition the griffin serves as a guardian of hidden treasure and represents valor and vigilance. Bishop Griffin placed the creature throughout his new Cathedral to guard the treasure of the Eucharist and to call his faithful to be vigilant as they wait for the return of the Eucharistic King. No small number of people today suggest that by the use of the griffin, the Bishop demonstrated his arrogance and pride. Perhaps, but he might have also been following the medieval/renaissance custom of members of the nobility placing their names upon buildings to show that they had carried out their civic duty; it could not be denied. This, I think, is more in keeping with Bishop Griffin's intentions. For the past several days I have noticed increasing weakness and swelling in my joints, particularly in my knees, a clear indication that autumn - and winter - has arrived and isn't going anywhere for quite a while. The weather continues to fluctuate not only in regards to the temperatures - 80 degrees one day and sixty the next - but also in terms of precipitation and fog, which are never good for arthritis. The only real way to combat this - medication only seems to keep the arthritis at bay - is sleep, which isn't easy to get with Mass at 6:30 every morning, and exercise, which I abhor and for which I don't usually have time. Be that as it may, I have decided that the time has again come to exercise to strengthen my joints in the battle with the arthritis. It certainly doesn't get rid of it, but it does keep it down, especially water exercise. One of the things I miss the most about Mundelein Seminary is the oncampus indoor pool, very handy for a quick swim at the beginning and end of the day. I don't have that here in Effingham, but at least there is a pool at one of the gyms in town at which I renewed my membership yesterday afternoon. The real trick will be finding the time to get there when the pool is free. The gym is only open until 9:00 p.m. throughout the week. If it were only open until 10:00...that would make things considerably easier. The Quincy City Council voted 8-5 Monday to reject a proposal to grant local landmark status to St. Boniface Church. The council acted after hearing emotional pleas from 10 speakers, most of whom tried to persuade aldermen to grant landmark status despite the objections of the Roman Catholic diocese, which opposed the measure. As expected, His Holiness Pope Benedict XVI this morning announced a consistory for the elevation of Cardinals of the Roman Church to be held November 24th (the text of the audience is not yet on the Vatican web site but the Vatican Information Service gives the list of names). Surprisingly missing from the listed is Archbishop Donald Wuerl, the Archbishop of Washington, D.C., which makes me wonder if Cardinal-Elect DiNardo won’t be transferred to a new See soon (this is merely speculation on my part). Today’s liturgical celebration, the Memorial of Saint Ignatius of Antioch, seems a fitting time to announce the elevation of Princes of the Church. A Cardinal of the Roman Church wears scarlet (red) to remind himself of the promise he makes to the Supreme Pontiff to willingly give his life in defense of the Church and of the Faith, should it ever be required of him. 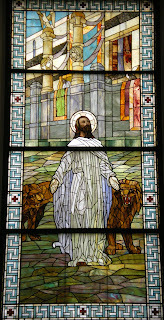 Ignatius begged the Christians in Rome to let him be thrown to the lions so that he might die for Christ Jesus who died for him. If these chosen men look to the example of Saint Ignatius of Antioch they will be very fine Cardinals of the Church indeed. You might want to take another read of the homily Pope Benedict gave at his consistory. At the General Audience this morning, His Holiness announced the next consistory for the elevation Cardinals. I'll post on it after Mass but until then, Rocco, as usual, has the goods. Yesterday while attending a funeral I received a telephone call from someone from Acquire the Fire teen ministry; apparently they're having a conference in St. Louis next month. Does anybody know anything about it? The web site isn't very helpful and I don't know if this is something I'll be interested in or not (though I'm leaning towards not). I've just discovered on our Diocesan web site the gallery page. On it, you can find pictures of various Diocesan events and pictures from travels Bishop Lucas makes across the Diocese. This past Sunday marked the anniversary of the dedication of the Cathedral of the Immaculate Conception in Springfield, Illinois. To honor the anniversary, I will try to post a series of posts about the Cathedral and the Bishop who built it. Our Diocese was first established and erected as the Diocese of Quincy on 29 July 1853 by His Holiness, Pope Pius IX, though we never had a resident Bishop for reasons I might relate at another time. Just a few years later the same Pontiff transferred the See City to Alton, Illinois. On 23 October 1923 Pope Pius XI transferred the See to Springfield, where it remains to this day. A mere eighteen days after the transfer of the See City, the Holy Father appointed James Aloysius Griffin, a priest of the Archdiocese of Chicago, the first Bishop of Springfield in Illinois. Let us go up now to our Episcopal City and there build the head fortress of our Diocese, the Mother Church of all our churches and people, a Memorial to our Immaculate Mother, a testimonial to the pioneer priests and laity of our Diocese, a Home worthy of our Eucharistic King. Rather than bring in a body of consulters and fund-raisers, as is the custom of our day, the Bishop himself was the sole campaigner for his new project, speaking across the Diocese at various functions for the Diamond Jubilee Cathedral Campaign. Bishop Griffin sought $750,000 from the people of the Diocese and received close to $1,000,000,000. 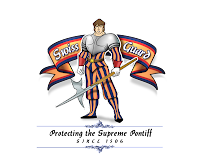 The campaign opened on 14 February 1927 with the motto, “It is God’s work. God wills it.” Apparently the slogan was rightly chosen! At such success, Bishop Griffin wrote to the Associated Press, “I believe I am the happiest man in America. May our new Cathedral be not only a house of prayer but also a symbol of lovely friendships and an incentive to greater civic service." Some of our World Youth Day pilgrims have learned that the average July temperatures in Sydney range from 55-70 degrees Fahrenheit, not too shabby as far as I'm concerned. Knowing that Australia is larger than we Americans often consider - at least this American - and that Cairns is some distance from Sydney, can anybody tell me the average July temperature there? There seems to be some growing concern as to the plausibility of scuba diving or snorkeling at the great barrier reef. Are there helpful web sites you might recommend for the parents of our pilgrims who want to track our travels, sites for weather, news, entertainment, etc.? Any help you can offer will be greatly appreciated. Thanks! Strip the altar of the Virgin and take the decorations away if there is no other way to assist the needy. Believe me, she will be much happier to see her Son's Gospel observed and her own altar bare than to see the altar fully adorned but her Son scorned. The Lord will then take care of sending someone who will give the Mother what she has lent to us. The United States Conference of Catholic Bishops has chosen the month of October of each year for us to focus and reflect upon the necessity of the respect for life. Too often do we focus only on the horrendous tragedy of abortion – grave as it is - while we ignore the plight of the poor, the malnourished, the imprisoned, the orphaned, the widowed and the sick. The respect for life to which Christ calls us includes all of humanity, from conception to death, male and female, rich and poor, black and white, innocent and guilty, holy and sinful, young and old. There is not a single human being who is not deserving of respect, compassion and love, because God created every person and in love died for every person. What then is the root of the lack of a respect for life in society today? Why has it so dimmed and is now in danger of being snuffed out? At the heart of it is a false understanding of mankind, and of individuality in particular. We look to ourselves first, and to God second. So focused are we on ourselves that we seldom take a genuine notice of those around us. Each of us is too content to consider only my own wants, needs and desires at the expense of the legitimate wants, needs and desires of others. In our daily lives we are like those nine who render no gratitude to Christ Jesus for restoring them to health (see Luke 17:17). We have become like ungrateful swine that fill their bellies on the slop of false teaching. We are like Naaman who refuses to wash in the river Jordan – despite the command of the Lord - because he knows its waters to be filthy (see II Kings 5:12). In our selfish pride we have believed the lie that we know better than the Lord our God, who created us and redeemed us. We have believed the lie that we are better or of greater dignity than others. We have believed the lie that some life can be discarded for our convenience, be it young or old. We have believed the lie that the “quality” of a person’s life somehow equates with their dignity. We have believed the lie that there is nothing to be gained in patient and faithful suffering. In all of this, we have ignored the example of the Savior who came to us when we deserved him not. Simply consider the love of God for us. When we greatly offended him and rightly deserved eternal punishment and condemnation because of our sin, he did not cast us off or abandon us to the power of death forever. Rather, in the fullness of time he became one of us, though without sin, and suffered death on the Cross for us, to redeem us and restore us to his friendship. When we abandoned God, he abandoned heaven and came in search of us. What greater love is there than this? Even today he goes in search of us, telling us, like Naaman, to wash ourselves in his waters, in the waters made holy by his death and resurrection, in the fountain of living water springing forth from his pierced side from which the sacraments derive their mighty and wondrous power. Whenever we are tempted to consider ourselves as more important than another, as better than another, we must recall what Christ has done for us. He acted not as we do. When we are wronged by another we seek revenge. When he was wronged by us, he gave up his life for us. He did not consider himself better than us – though by his very nature he is! – but humbled himself, taking the form of a slave. He calls us not to the path of pride, but to the path of humility, by which he leads us to see in each person the reflection of his own image, be they rich or poor, smart or foolish, swift or slow, cool or dorky. If this is true, why are we so slow to speak up when we encounter a lack of respect for life and an attack on human dignity? Why do we not defend the downtrodden and lift up those whom the world casts down with all the strength we have? 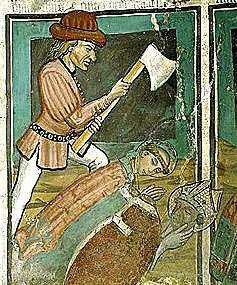 Saint John Chrysostom reminds us that “nothing can bind the tongue but cowardice and unbelief.” When we remain silent in the face of these evils, it is either because we are too afraid of what someone else might think of us for standing up for the truth, or because we do not believe that all people are created in the image and likeness of God. Sadly, the decision to stand up for the right to life, to encourage and foster a greater and more profound respect for life, is today met with much opposition. Those who defend life and promote the fundamental dignity of the human person – of every person – are too often vilified, even by those who claim to follow Christ. They are looked down upon and discouraged from their holy and just endeavors. To those who truly seek to promote the dignity of human life are the words of Saint Paul addressed: “If we have died with him we shall also live with him; if we persevere we shall also reign with him” (II Timothy 2:11-12). “What is the meaning of ‘If we [persevere]’? If we patiently bear tribulations and persecutions… [This] narrow path is unattractive by nature but becomes easy when we choose to follow it, because of our hope for the future.” To promote true human dignity today is to walk the narrow path. It is difficult to stand up for the truth, to condemn injustice, to right what is wrong; but this we must do, for in so doing we render thanks to the One who created us and gives us life and recognize that we have been healed by his command. Let us then beg the Lord Jesus Christ to make our hearts ever more like unto his own, that we might be truly grateful to him for having saved us from sin and death and restoring us to his friendship. In this way, may we strive to treat others not as our lessers, but as our brothers and sisters in Christ, who have also been redeemed by his death and resurrection. By remembering his mercy toward us, let us have mercy toward others. In this way, may the respect for life and the true dignity of every person take root in the hearts of all men and women of good will. Saint John Chrysostom, Homilies on II Timothy, 4. Saint John Chrysostom, Homilies on John, 87.3. If a body tranquilly eats the food that will become a meal for worms along with it, how much more peace and tranquility will the soul need to take its food, which is God Himself! Sr. Mary Martha has a good post about religious orders, reminding – with her usual humor and candor - us that monks and friars aren’t gangsters. Father V. at Adam’s Ale has a discussion going about clerical collars, and Fr. Schnippel at Called by Name adds his thoughts to the topic. Fr. V. also takes a look at the bear on the Holy Father’s coat of arms. All good things, they say, must come to an end (heaven excepted, of course). It would seem that soccer is no exception to this rule. Following tonight’s sectional game versus their archrival, the Teutopolis Wooden Shoes, the St. Anthony Bulldogs’ season has come to an end. The Bulldog’s played an exceptionally good game, giving the Wooden Shoes a hard fight for their 1-0 victory. I’m very proud of how the boys played tonight and I am grateful to them for the many good laughs we’ve had during the season. My new capello Romano (Roman hat) made its first public appearance at the game, though I regret to say I forgot to get a picture. It is very safe to say that I will miss the soccer season, both the practices and the games. I will, of course, still see the players in the high school and I even teach a few of them. Nevertheless, I will miss the time spent with them at practice, on the bus and on the field. They were, and are, always good for a laugh and for entertainment. I will also miss the very good distraction they’ve provided me these past couple of months. I’ve blogged before how my involvement with the team seems to have come quite providentially; reflecting back on the past several weeks I still believe this to be true, and I’m grateful to our athletic director for proposing the situation in the first place. The ways of the Lord are wondrous indeed; just two years ago (or even three months ago), who would have considered the possibility of my being an assistant soccer coach, or any kind of coach for that matter? Whenever I told those friends who know me best, I was met with the same reaction: laughter, followed by the question (or something very close to it), “What?” I never would have imagined it myself, but then again, the Lord knows what will make us happy more than we do. The trick is to accept his will, as odd or foreign as it might seem to us and then sit back and marvel at what he does. I never played sports growing up (with the exception of a bit of soccer at home waiting for the school bus) and I never really liked them; for that matter, soccer is the only sport I like, though volleyball is growing on me (I rather dread the coming basketball season). I’ve always been very much at home, comfortable and content with a good book, lying on a couch under an afghan (the one I currently have and use – and am under right now - was a gift on my college graduation [and there’s a book within arm’s reach]). I suppose what the Lord has given me is something of what Saint Paul meant when he said that he has “become all things to all, to save at least some. All this I do for the sake of the gospel, so that I too may have a share in it” (I Corinthians 9:22-23). I have been blessed in many ways through my involvement with the soccer team, in many ways that I cannot quite put into words. It is my hope and my prayer that at least some of the players were blessed by my presence. Congratulations, boys, on a game well played, and many thanks! Written request to speak under suspended rules by the Quincy Preservation Commission presenting a power point by Kirby Eber, 422 S. 18th, Nathaniel Brooks, 234 S. 16th, Janet Conover, 210 EastAvenue, Chairman of Quincy Preservation Commission, Steve Tieken, 3001 Lincoln Hill N.E., Reg Ankrom, 1476 Hampshire, RobertW. Cook, 310 S. 16th, Charles Rollins, 1677 Maine, Vicki Ebbing, 1515 Kentucky, and Msgr. Michael Kuse, 1119 S. 7th, regarding Local Landmark designation for St. Boniface Church, 641 Maine. Nathaniel Brooks, 234 S. 16th, Vice Chairman of Quincy Preservation Commission, stated the former St. Boniface Church Building is a characteristic example of mid century modern architecture displaying many modernism hallmarks which include a lack of traditional ornamentation, exposed structural materials and an emphasis on simplified horizontal and vertical planes and surfaces throughout the building. The building’s religious function is clearly identifiable and the structure features a variety of abstracted decorative and symbolic elements. Because of its urban nature and the way in which it synthesizes traditional forms in the modern design language, the building is a valuable asset to the City of Quincy’s architectural heritage. The design and construction of St. Boniface clearly meet the Preservations Commission’s goals of recognizing local buildings based on their architectural significance. The architectural significance makes St. Boniface deserving of the Council’s vote to help preserve this important building for future Quincyans. Janet Conover, 210 EastAvenue, Chairman of Quincy Preservation Commission, stated they realize it is a hard decision when a property is recommended without the owner’s consent, and even more difficult when the owner is the Roman Catholic Church. As members of the Commission, they have weighed the pros and cons of this designation for over a year. The St. Boniface Catholic Church has become a hallmark and anchor of the downtown, and with its 186’, stainless steel spire and cross, it is a recognized and spiritual landmark for the entire Quincy area. Should St. Boniface Church ever be demolished or significantly altered, most citizens of the Quincy area will feel a great disheartening. The Quincy Preservation Commission proudly recommends to the Mayor and City Council that St. Boniface Church at 641 Maine Street be granted Quincy Local Landmark Designation. Steve Tieken, 3001 Lincoln Hill N.E., is here as a spokesman for architect JohnA. Benya. He stated he has led the forefront on the research on John Benya. St. Boniface Church is a masterpiece in modern design. The importance of St. Boniface Church is viable and deserving of a landmark status. Reg Ankrom, 1476 Hampshire, stated this is a parish community that no longer exists but the church is about the art and beauty of this building with features making it a Quincy gem. It is recognized as a significant architectural structure. This building is significant in art and architect and deserves the landmark status. Robert W. Cook, 310 South 16th, stated the council had received copies of petitions signed by more than 2000 people to landmark St. Boniface Church.Why would all the people sign these petitions? It is certainly not because they have some financial interest in the outcome. Some are interested in architecture and are concerned that a structure listed as among the 150 most important architectural structures in Illinois might be destroyed. He continued to site why the people signed this petition and ask that the Council listen to the Preservation Commission and grant landmark status to St. Boniface Church. Charles Rollins, 1677 Maine, supports the designation as a landmark status. He is not speaking from a religious aspect or as a longtime resident of Quincy. St. Boniface Church became a de facto landmark for him when he drove into Quincy almost four years ago. While exploring the streets and marveling at the many beautiful and diverse examples of architecture, he decided this is the place he would like to call home. He believes there are times when a building has so much historical value and is so important, so meaningful and so familiar to so many people for so many different reasons that its overall significant transcends individual ownership. That structure is deserving of some special status. This describes St. Boniface Church. The special status St. Boniface deserves is to be a Quincy Local Landmark. Vicki Ebbing, 1515 Kentucky, stated she was here on a professional and personal level. She professionally represents Gardner Museum of Architectural and Design as their Museum Coordinator and also representing Quincy Preserve as an officer and the Quincy Historic Business District. On behalf of the Board of Directors and many members of these organizations, they strongly encourage the acceptance of St. Boniface Church as a local landmark. On a personal basis, St. Boniface Church has been an intricate part of the Ebbing family for many years and they would like to see it as a local landmark also. She also presented to the Council a letter from the Quincy Historic Business District. Monsignor Michael Kuse, 1119 South 7th, representing the Diocese of Springfield and Bishop George Lucas. The Roman Catholic Diocese of Springfield, Illinois is the property owner of St. Boniface Church. They are opposed to landmark designation mainly because of the restriction it brings to anyone, whether they remain the owner or not. They feel that as owners, they should be asking for landmark designation not someone else. They are looking for someone to have this building that will retain the outside as well as the inside. He spoke of his family history with the church and was not speaking as an outsider. He asked how the Council would respond if someone put their home up for landmark status and they had nothing to say about it. 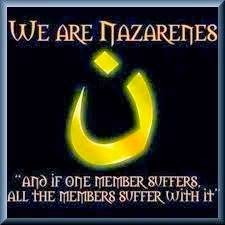 They hope not to have the church destroyed in 60 days. Their hope is that it will stand as a status and will remain in this community. They will not sell it to someone who wants to use it in a profane way to hurt the hearts of people. Ald. Farha moved the rules be resumed. Motion carried. Ald. Bumbry moved the ordinance be read by its title, seconded by Ald. Duesterhaus. Motion carried.The City Clerk read the ordinance by its title. The former St. Boniface school building will be transformed into office space, an idea which actually makes a great deal of sense. Meanwhile, aldermen in the city of Quincy seem spit as to whether or not to grant landmark status to St. Boniface church. The Crescat has some images of some beautiful Gospel Book covers, and one not-so-nice one, as well as pictures from the Cathedral of St. Denis, including the tombs. Oh, and she's also asking for your guilty pleasures. The Quincy City Council is meeting as I type and is hearing the second of three readings to consider whether or not St. Bonfiace church should be granted landmark status, a decision which the city seems to support and the Diocese opposes. The Quincy Herald-Whig has an article on tonight's meeting. I've blogged about this situation before here, here, here, here and here. Late last week I went to our local Christian book store to pick up a copy of the Ignatius Bible, second edition (the one that has headings throughout the text; these are very helpful when looking for certain passages). I was hoping to pick up the smallest version to carry around but, as they were out of it (or they don't yet publish it; I can't quite tell), I picked up a regular-sized Bible with a hard cover with images of the four Evangelists and Christ on it. I'm very pleased with it. The binding is good, the printing is good, the pages are good. I recommend it. But be sure to get the Second Catholic edition; I don't know why the First Edition doesn't have headings. 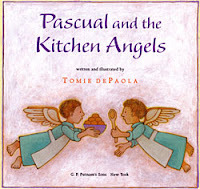 B rowsing around in the store I found a little book by Tomie de Paola, Pascual and the Kitchen Angels. It is a delightful children's story about Saint Paschal Baylon (of whom I happen to have a relic). I knew him to be very devoted to the Holy Eucharist and thus patron of Eucharistic Congresses, but I didn't know he was the patron saint of the kitchen. With it's delightful and characteristic artwork, the easily flowing story and the life of a saint, this little book will be good for story time for children of all ages. 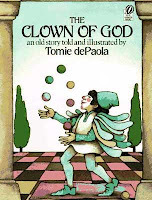 I first discovered de Paola's work in college when m y professor for the class on the theology of death read de Paola's The Clown of God to us. I loved the story then, picked up a copy of it, and I read it my classes at the highschool and I've even based a Confirmation retreat around it. It goes over pretty well. Adam's Ale has a good post on that blasted liturgical intruder, the "unity" candle. I do my darndest to encourage couples not to use one and, when I'm pastor, I simply won't allow them, not within the Liturgy anyway. For months rumors have circulated that the next Encyclical Letter from His Holiness Benedict XVI would be of a social nature, but I've often wondered whether or not this is true. It just doesn't quite seem to fit the overall themes to which the Pontiff devotes his words. He does speak often enough of socially minded things, but often within the greater context of faith, particularly of the love of God. Many were surprised at the topic of his first Encyclical Deus caritas est (appropriately released - if not seemingly delayed at an irritating rate - on Christmas Day); I was not. It fits perfectly well within the framework of all of his words, both spoken and written, both as Bishop of Rome and as Cardinal-theologian. Those who had read Cardinal Ratzinger couldn't help but notice the connections. Now, newer rumors seem to be circulating as to the topic of the next Encylical: hope. This seems much more likely to me and, frankly, much more exciting and, well, hopeful. If these new rumors are true, which I do hope they are, I will greatly look forward to the Encyclical; not so much so if it is about social things. Pope Benedict has a knack for getting right to the heart of the issue, and what better way could he do so than to first write an Encyclical on love, then on hope, and finally on faith? I wouldn't be at all surprised if this is the plan. May God grant that it is so! Hat tip to the American Papist. Drew at the Shrine of the Holy Whapping - always good for a laugh or an intellectual intrigue - thinks so, too. 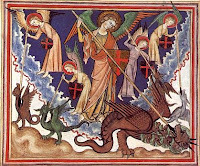 This morning as I was waiting as new tires were put on my car - apparently I'm not very kind to tires - I finished reading Angels (and Demons): What Do We Really Know About Them? by Peter Kreeft. This publication of Ignatius Press is a series of one hundred questions Peter Kreeft has encountered in his teaching career, covering topics from whether or not angels exist to whether they can eat food, and everything in between. I daresay there is not a topic he does not include. The answers he provides are clear, to the point, and always in line with Church teaching. This little book should be on the bookshelves of most everybody, especially as more and more people become interested in angels. It will be helpful for those who are simply curious and essential to those who wish to teach about angels. I give it my hearty recomendation. Douglas McManaman has written a fine article about Eucharistic adoration entitled, "How to Explain the Importance of Praying Before the Blessed Sacrament." "What do you say to God when you pray," he inquired. "Nothing," replied Mother Teresa. "I just listen." "What does God say to you?" he responded, rather derisively. "Nothing," replied Mother Teresa. "He just listens." The entire article is well worth a read; it's only four pages. Most every Sunday evening a group of young people meet in the parish called the Dead Theologians Society. It is a group of high school students and a couple of college freshmen, headed up by yours truly, that meet for two hours for fun, food, and the saints. It’s a delightful group of anywhere between six and twelve people and, though I am most always rather tired by the time Sunday evening rolls around, it is always a joy to be with them. We usually meet in the “attic” of the parish center, which is not air conditioned. I went upstairs before the group arrived and made the executive decision not to hold our usual time for prayer and study of the life of a saint simply because it was hotter in the room than it was outside. Had we gone upstairs, we might not have come down. Sometimes prudence has to step in. Instead, we spent a good hour and a half playing Uno, a game that I always enjoy, a game that true Uno aficionados will admit is among the most violent games known to man (if played properly). Sadly, we didn’t play that game quite right; nobody was injured and nobody was insulted, though there was a fair amount of friendly argumentation and contradiction. Once we had our fill of Uno we went outside for a good game of Ultimate Frisbee. I’d forgotten what poor shape I’m in! Even so, it was remarked, “Father’s got skills!” To which I replied, “Skills, yes; a strong heart and lungs, no.” One of these days I’ll get in shape. Maybe. After about half an hour of this we sat down and most of the group left, but a fair number stayed around for up to two hours simply chatting away, talking about nearly everything under the sun. Toward the end of the conversation the topic shifted toward priests and vocations and parents’ responses to vocations and to the different personalities of priests, etc., etc., etc. It was a good conversation all in all and it makes me all the more aware of what we priests need to be doing if we hope to “recruit” vocations. From a sociological standpoint, priests continually seem to be the happiest of people, even if the busiest. How is it then that so many people have the wrong impression that we are not happy, that we are lonely, bored and maybe even depressed? I don’t have an easy answer for this question. Part of the answer certainly has to do with the fact that priests are not as involved in the lives of their parishioners as once they were, something that I regret. Part of the answer has to do with the fact that we priests do more than our fair share of complaining, which I also regret and of which I am becoming increasingly aware. Part of the answer has to do with a misperception of priesthood and the duties it entails, which probably comes from the fact that we priests don’t do a very good job describing our life to people (in no small part because one day can be so very different from the next). Part of the answer has to do with the risky association of happiness with a full, beaming smile all of the time; some people just don’t have a natural smile even though they are quite happy and content. Part of the answer has to do with the false assumption that spirituality and religion, this “Church stuff” isn’t satisfying and rewarding. I’m not by any means trying to say that I am a saint, but I do think that if I find myself exhausted at the end of the day because I have been busy about the Lord’s work, then I must be on the right path and I am probably doing the work he asks of me. There is, of course, always the danger that I am not, but it’s not every day that you can simply sit down in a parking lot and have these sorts of conversations with high school students, much less adults; in fact, it’s probably less likely to ever happen with adults. Am I happy to be a priest? Yes. Am I happy to be a tired and many times exhausted priest? Yes. At the end of my life do I want someone to say of me, “He spent his life for God”? Absolutely. Browsing around today at web sites I haven't visited in many months I discovered a new blog: Holy Priesthood. It is run by Fathers Ben and Joel, two twin priests ordained only three months ago. I was with them for a time at Mundelein Seminary before they went off to Rome. This morning I had the pleasure of speaking to the Catholic Daughters of America during their day of reflection. I spoke with them briefly about the role of women in the Church, using Pope Benedict XVI's reflection on the women who assisted Jesus and who collaborated with Paul. They really enjoyed it and I enjoyed them. In just a few minutes, after I pack up my things, I will be heading to Paris, Illinois - a little over an hour away - to fill in for a priest who had knee surgery a few weeks back; our retired priest is filling in for me in Effingham. Tomorrow morning will be exhausting: Mass at 7:00 a.m. in North Arm, the mission of St. Mary's in Paris, and then it's back to Paris for Mass at 8:30 a.m. and 11:00 a.m. I've not celebrated three Masses before Noon for quite some time, for which I am grateful. I'm quite tired after my first Mass of the day and half-dead after the second. You don't really want to see me after my third. Suffice it to say that I will be taking a nap in Paris before returning to Effingham. ...And my homily this weekend will be short, for which my parishioners in Effingham will no doubt be jealous as it happens rarely. To those in Effingham, I wish to remind you about the Life Chain to be held tomorrow from 2:00 p.m. - 3:00 p.m. outside of Sacred Heart church. If you can't attend, please be sure to pray for a greater respect for life in our nation. You won't see me there because, if I'm not sleeping, I'll be on the highway. Last week I had the opportunity to capture two nice scenes on film. Prior to the Blessing of Animals on the Feast of Saint Francis of Assisi, I was hoping for one of two animals to make an appearance: a goldfish or a horse. I was hoping for a goldfish just for the novelty of it and I was hoping for a horse so that I might afterwards ride down to the highschool (it's only four blocks) for a grand entrance to the soccer game. Thomas at American Papist is looking for good desktop wallpaper themed around World Youth Day. He's especially looking for one with a countdown timer. Father Stephanos reminds us of the distinction between monks and friars. Nicholas over at Phat Catholic has a continuing series of daily thoughts from Saint Francis de Sales (I will be getting back to Ponderables from the Poverello). The Shrine of the Holy Whapping has a great episcopal photo caption that references one of the greatest cartoons of all time. 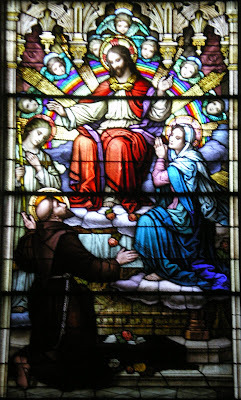 Andrew at Unam Sanctam has a fine post on Saint Francis of Assisi. I thought you might be interested to know that we have now secured lodging for our four-day layover in Hawaii and for our four-day stop at Cairns, Australia to visit the Great Barrier Reef. Last night we decided on a hotel in Sydney for the ten days we will be there and will book it later today. We've chosen a four-star hotel in downtown Sydney, just over a mile from the racetrack where the Holy Father will celebrate the Holy Mass. The costs we're spending on the hotel will be saved by not having to rent vehicles. It's all coming together nicely, and rather easily I might add. The only disappointing part is that it doesn't look like we'll make it to New Zealand (unless our fundraising goes exceedingly well). Now we need to decide what to do and where to stay after WYD until we return to the U.S.
Update: The Effingham Daily News has the story here. The St. Anthony Bulldogs lost the varisty match last night 3-1 to the Teutopolis Wooden Shoes, though the Bulldogs took the J-V match 2-1, I believe (I had to sneak off early to teach R.C.I.A.). The Bulldogs next play in Hillsboro on Thursday. It seems there was some sort of a mix up in Rome and my hat has not yet shipped. It should now be shipping today or tomorrow. vigorously bear the arms of your unconquerable Leader! you will overcome all adversaries. as authentic and beyond reproach. should show them deep devotion. emblazoned with the sign of the cross. with a sword of compassionate sorrow. is believed as undoubtedly true. and bearing upon you the sign of the living God. ploughed into the dust of your flesh. A new landmark in Quincy?